Why do I still have moments of mindless consumption? I enjoy mindful consumption. I love the warm and fuzzy feeling that comes with consciously making a wise purchase. Even a small purchase like buying local milk, makes me happy because I know my money is supporting a local business that treats their cows kindly. Mindful consumption takes time, but I know the benefits are worth the effort. Little Eco started ballet a few weeks ago. Part of me wanted to race out and buy her a new leotard, skirt and shoes straight away. I nearly did. All it would have taken was one trip to the shops and we would have been done. Instead, we've been searching through the second hand box at the studio each week. We found a leotard and a gorgeous hand-made skirt that someone had lovingly made, each for only a few dollars. The shoes have taken a little longer. Little Eco wore bare feet to class for the first two weeks. 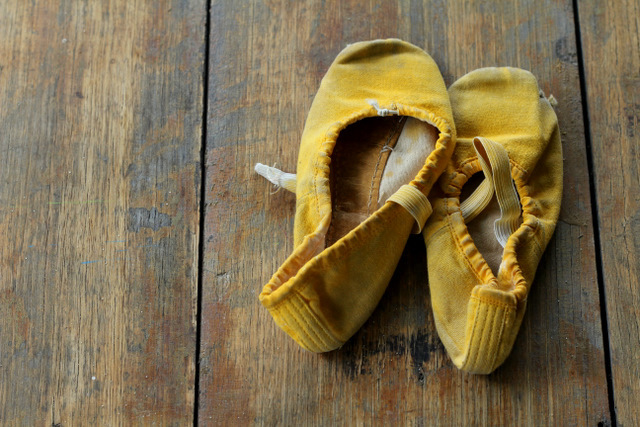 Then we discovered these very pre-loved ballet shoes in the box. They were free. They've been painted yellow at some stage, have a few holes, and the elastic was worn. 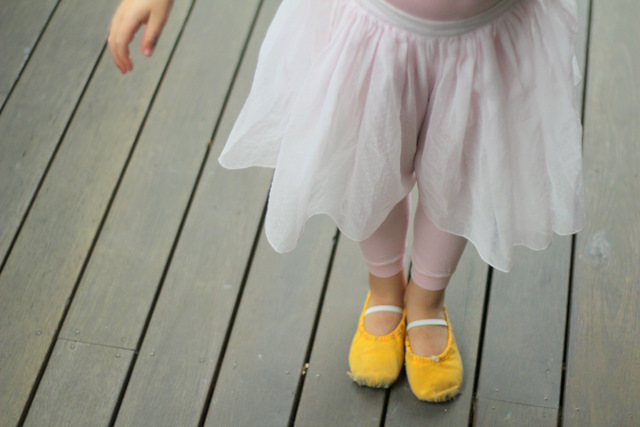 Despite their 'character', Little Eco was thrilled that we'd found her a pair of ballet shoes. I replaced the elastic and she proudly wore them to the following class, even though every other girl wore pink shoes. I was so proud of her. Hopefully we'll discover a pair of pink shoes in the box in the next few weeks. I'm pleased that Little Eco is learning to wait and I know she is going to appreciate them when they appear. We visited our local show recently. 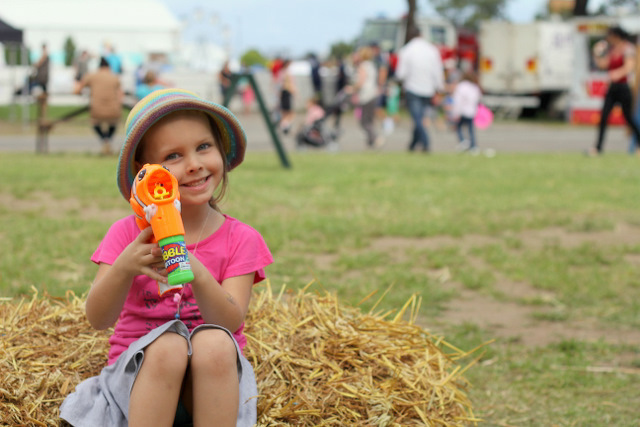 Little Eco enjoyed a few rides and we wandered through the animal and craft displays. Little Eco asked repeatedly for a plastic bubble making machine. There were kids everywhere blowing bubbles. In a moment of tiredness we gave in and bought her one. I felt regret straight away. $10! What a waste of money. All that plastic, and even a battery, when we could have easily made our own. Not unexpectedly, the bubble machine broke within a few hours causing Little Eco more grief than enjoyment. Why do I still have moments of mindless consumption? Is it feeling tired, lazy, impatient or greedy? Whatever the cause, I'm pleased that moments of mindless consumption are becoming fewer. I know they give me no joy, so why go there? How about you? Do you still have moments of mindless consumption? I've been avoiding op shops lately. I recently mentioned that I like the idea of becoming a minimalist, but can't because I enjoy op shopping too much. I find it almost impossible to walk away from all those 'once in a lifetime' finds. That's one of the problems with thrift shopping, all too often I see things I love but don't need. What if I never see the same for sale ever again? I may need it one day. How can I resist? It's only a few dollars. I'm hopeless. So rather than be tempted I simply stay away from op shops. This week I couldn't avoid op shopping. I had to build up my stash of old t-shirts so that I could make a fourth set of dress-up wings in as many weeks. It's birthday season among Little Eco's friends and i've decided to gift them all refashioned wings. They've been a huge hit so far. Anyway, back to the op shopping and me being hopeless. Here's what I walked away with this week. Little Eco and I fell in love with this pram as soon as we spotted it. It looked familiar. My mum has since told me that she had one just like it when she was young, so perhaps i'd seen hers in old photographs. Little Eco already has three prams, so this one wasn't exactly needed. Although, as she informed me, she didn't have any where her dolls could lie down. True. Sold! Then there was this crochet double bed spread. Totally perfect for the antique double bed Little Eco will use one day (currently our spare bed). Again not needed, because I'm sure it will be years before we move her into that bed. But truly, I couldn't very well not buy something so delightful, could I? Then there's these pyrex dishes. I like collecting old ceramic casserole dishes and recycling them as pots for house plants. I wanted to use these for growing micro-greens. But I'm certain it's impossible to drill through pyrex (i'd love someone to tell me i'm wrong) and guessed that, so really shouldn't have bought these at all. Are you able to resist 'once in a lifetime' thrift shop finds that you don't really need? Want to be tempted by more vintage lovelies? Head on over to Sophie's for this weeks Flea Market Finds. I'll be drawing the Biome giveaway tomorrow night, so head on over and enter if you havn't already.